This week I chose to write of gratitude, while thinking of the recent devastating events that happened at the Boston Marathon and how many lives were lost, or forever damaged without a moment's notice. I felt compelled to bring it back to an inner-most feeling that we all have, yet one that seems to escape us and get lost in the daily hustle and bustle of life. Every morning when you wake up, what are you thinking? What are you feeling? Like most (me included! ), I’m thinking about what the day ahead looks like. How many activities do we have going on? Does the day include grocery shopping? What time are we going to the dog park with Archer? Can I fit in a 3-mile run, or perhaps a 6-miler? amount of time, so it’s easy to forget gratitude. the husband and/or wife who work long hours, to provide all of these things for their family. It’s so easy to get caught up in our stresses and worries that we miss our children making up new games or songs to sing. We miss being able to see the pure joy on their faces when they’ve learned a new phrase, or how to count to 10. I know, because I’ve been there. For me, yoga has been a practice that really helps me balance my life and innermost feelings. I have sporadically practiced yoga since the age of 19, and I have recently re-awakened the joy and gratitude I feel when yoga is a part of my weekly routine. Yoga helps me to quiet my mind (because like most parents, it rumbles and whizzes 24 hours a day!). I focus on my breathing, zero in on any tension or stress I may be carrying around, and learn to release it. Yoga helps me to be in the moment and bring everything that is most important back into my perspective. Today during my morning class, I thought about how fortunate I am to stay at home with my 2-year old daughter while my husband works crazy hours in a high-stress environment to provide for us. How thankful I am that we’re all in relatively good health. I took a long moment to be grateful that even though we’ve had numerous struggles and financial hardships, we always, always find some way to rise above. I credit this to so many people who are in my life that have been in similar predicaments -- family members, friends, acquaintances. Yet despite the hardships they’ve faced, they stay strong and positive. They don’t let these situations shake their spirit. Their tenacity and drive is what keeps them moving forward, with hearts full of gratitude. Why live your life any other way? We all know how short it can be, or how sudden things can change. Change is the only consistent thing in this world. an email or make a quick phone call. When you make gratitude a part of your daily life, you end up lighter, a little happier and you know that no matter what may happen during the day, you’ve said your thanks and you can smile at that. You can smile at the imperfections in your life and embrace every crazy, stressful moment a little easier. means she’s healthy, active and simply can find so much joy in life! I sure learn a lot from her. long romp at the dog park, he’s the best cuddle bug ever (aside from my husband, of course). To Boston, and everyone else affected by the recent events, my heart goes out to all of you. May you find peace and a quiet strength to carry you through this tragedy. As a runner myself and a part of Mom’s RUN This Town, we will keep running for Boston and the lives forever changed that day -- and we will keep running for each other. 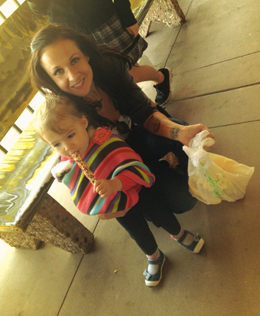 Jane Walker is a Menifee resident, a wife and mother of a 2-year-old girl. Every Thursday, she shares her experiences as a Menifee mom. Jane welcomes your comments here. Thank you Luie and Heather! I'm absolutely loving what I do :) And good luck to you and your family as always! You are amazing people. So well said....I have three boys and they are ca-razy and tottaly drive me bonkers, but it is in those rare moments when my house is still and they are with each other, playing or just talking and carrying on....watching them be best friends and brothers is truly the best feeling in the world. Great job Jane!